200mm side has been bordered with a delicately carved bound rush pattern. This has been overlaid with fine linen which was used as a ground for gold leaf. Many small fragments of gold can still be seen in the incisions between the basketwork border and the plain panel below. In the centrc of this is a serekh gateway, on which is seated the falcon god Horus. The reverse side is edged with a carved band of bound rush, which also was gilded. The main body is inlaid with small triangles of wood and moulded faience which have badly faded in colour. They were arranged in an alternating pattern and held in position with some type of yellow binding medium. 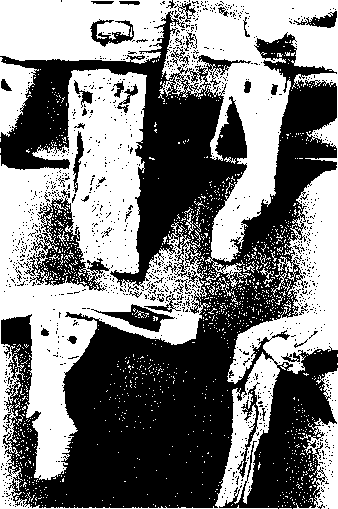 Ivory strips, which have been engraved with various straight-line, nail-head and interlocking chain patterns, were also used to decorate furniture (figure 25). They were held in position with small ivory dowels. These features have been discovered at both Saqqara and Abydos which suggests that carpenters were following common design practices in both Upper and Lower Egypt. angled elbows formed in them (figure 26, bottom right). At the elbow of each was housed, in around hole, the long straight end of the opposing branch. The short ends below each elbow formed the legs of the bed. 25. First Dynasty patterns incised into ivory strips. leather, which would have been soaked in water and then allowed to dry, so pulling the joint firmly together. Some of the better-quality bed-frames have slots cut into them to accept a wide cord webbing while others simply had the cord webbing woven around the poles of the frame. On one type, the leg, side and cross rail all meet in a common mortise (figure 26, top right). 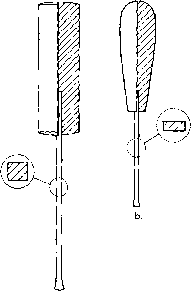 In the other type the cross-rail tenon is spaced away from the leg, leaving the leg to be separately mortised into the underside of the side rail (figure 26, bottom left). A fine example of this type of construction is preserved in the Manchester Museum (figure 28). 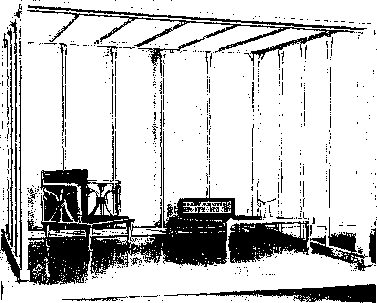 It is 1.76 metres long and was the largest of the bed-frames discovered by Petrie at Tarkhan (though still smaller than the bed-frames commonly used today) and was converted from a short log. The ends of the side rails have handles carved in the shape of the papyrus flower, a common design feature found on furniture of this period and the Old Kingdom. The handles were also covered with leather sheet, perhaps glued into position with some primitive adhesive or shrunk into place. 29. Bed-frame with curved side rails, First Dynasty, Gebelein. (Oriental Institute, University of Chicago, 12169. Photograph by courtesy of the Oriental Institute of the University of moulded side rails. The cross rails are stub-mortised and tenoned into the side rails and webbing slots are chopped into the frame. The accurate shaping of the frame with its graceful curves illustrates the high degree of carpentry skills being practised by Early Dynastic craftsmen in a limited number of specially commissioned works. The joint of the leg and side rail is lashed together with a sophisticated binding of leather which also passed through slots in the cross rail. Only one end of the side rails has been carved with a stylised papyrus-flower handle. A similar bed-frame can be seen in the Musées Royaux d'Art et d'Histoire, Brussels. Further interesting discoveries were made at Tarkhan. Two small tables were found, each of which was cut from a single block of wood. One was set on four projecting pads and the other on a pair of supports (figure 30). Petrie also discovered two sandal trays, again cut from solid blocks of timber and with a central bar of wood. 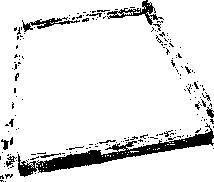 This is shaped to the outline of a foot and the tray is hollowed out below (figure 31). This bar may have been used as a carrying handle, although the small projection at one end was perhaps intended for this purpose. Whether the tray was used to clean sandals or to hold some early chiropody implements or materials used in the cosmetic care of feet we do not know. 30. Low table, First Dynasty, Tarkhan. The first examples of seats are depicted on a number of stelae discovered in the Second Dynasty tombs at Helwan by the Egyptian Egyptologist Zaky Y. Saad in 1952. From these we can establish that stools, with bovine-shaped legs of similar construction to the bed-frames, were commonly used by Egyptians during the Second Dynasty. One stela from Helwan shows Nefer-meri-ka seated on a stool with the ends of each side rail finished with a papyrus-flower terminal. The stela has been carved in an unusual way to show both the side of the seat and its top in one view (figure 32). Another stela, of Prince Nisu-heqet, is remarkable, for it shows him seated on a chair with a high back post and a stretcher below the seat (figure 33). Being of royal descent, the prince would normally be expected to be portrayed seated on a special piece of furniture and so it seems reasonable to assume that this might represent an early throne.